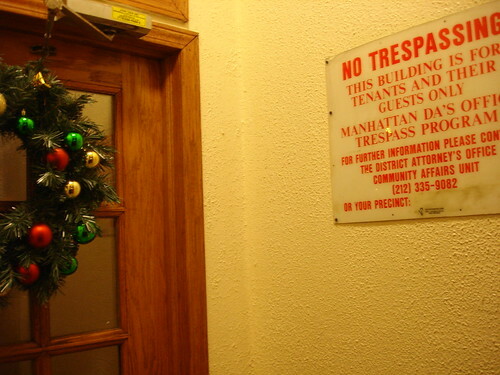 happy holidays and absolutely no trespassing* to you and you and you, from our management company. i kind of enjoy the combination of goodwill and bossiness that erupts around the city in december. when joe and i were leaving our apartment last night, a cab screeched to a stop in front of our steps: "hey man," the driver yelled, "where is your coat?" we said that we were just crossing the street to get to the gym, and he nodded and zoomed away. on the gym: to my great surprise, i've continued to go (nine times now since the quit - at this rate i might actually hit 100 visits in time to knock off 017 on my 101 in 1001 list). to my horror, i'm starting to enjoy myself a tiny bit. this breathing-hard-without-pain thing is fascinating! the new rub is that i'm not really interested in anything other than cardio: though i'm developing a moderate interest in running** and dig elliptical machines, weight machines (and free weights) are deadly boring. can one get ridiculously fit without them? *and no hot showering, apparently. they've been real creeps about consistent heating thus far this season - trying to freeze the sweet old ladies out of the building, i'd imagine. **on a treadmill, mind you. i'm wa-ay too self-conscious to run in public. ridiculously fit + new ink = (in my head, or in my teenage head) henry rollins. and you are much hotter than henry rollins, now and ever. nor are you likely to get "search and destroy" tattooed across your shoulders. very asymmetrical, mrph. try the rowing machine again! it's great for the shoulders and the back. i miss it enough (we are sans gym in berlin, but have mucho running) that someone should be enjoying it for me. good luck with the quit, hey. Personally, I'm a big fan of the non-stationary bike. You find a park or something. (There's a biggish one nearby your place, I think. Nice and rectangular.) You get a workout and feel wind in your hair and all that jazz. I'm not exactly a fan of running--although I can do it fairly well for a guy of my (lack of) fitness, as today's adventures in getting to Court can attest, there's too much banging around of muscles and tendons and such.